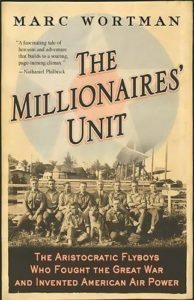 The Millionaires’ Unit tells the story of several Yale undergraduates in the early 1900s whose foresight helped open the United States Navy up to the utility of aerial operations. American military aviation was woefully behind that of the European militaries when the US entered World War I. The Yale Unit was one of the critical catalysts in getting the US Navy to adopt and implement aviation in its strategy and operations. The Yale Unit was comprised of the first American aviators in Europe in WWI, and helped develop tactics and standard operating procedures – often by learning the hard way of what didn’t work. 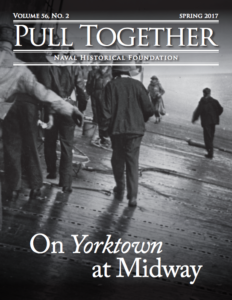 The book recounts a tale of the key members’ personalities, relationships, personal and professional struggles, and life in that era to draw the reader into the momentous change the Yale Unit members brought about in the Navy. Through the book, you see how unprepared America was for WWI, how the Yale Unit members’ access to money and power allowed them to purchase planes and train despite the US Navy’s slowness to adopt the Unit, and how the Unit members served in various positions to help grow the US Navy’s air power. “Section I: Earth” describes Yale in the early 1900s at length, and while enlightening, is perhaps a bit more background and latent character development than the reader really needs. The other sections of the book, drawn from letters, typescripts of reunions, and news at the time, are more captivating. If you can push through the first section’s heavy dwelling on Yale boat regattas, dances, and anxiety over sports, social position and secret society taps, the book does get down to the business of aviation. The descriptions of aerial combat are compelling, and various vignettes did an outstanding job of painting a picture of the horrors of war without becoming grotesque. The book exposed the high death rate experienced by fliers in training and shed light on the carnage aerial power was capable of raining on those under attack on the ground. The description of a German soldier unhitching and comforting a team of horses in a field while the rest of the column was strafed, and how the Allied aviators never shot at him, was a touching moment of humanity in what was a long, often inhumane war. 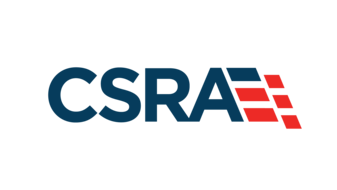 The book is built mainly on primary source material from the Unit members themselves, including letters and reunion transcripts, contemporaneous newspaper and radio accounts, and the Yale University archives. Wortman’s book lacks a bibliography, but has a solid citation section. The index is thorough and covers most topics one might be searching for. One book frequently cited was Ralph D. Payne’s The First Yale Unit: A Story of Naval Aviation, 1916-1919, printed in 1925 in several volumes. Marc Wortman, despite his knowledge of Yale and editing the Yale Alumni Magazine for five years, is himself a Brown and Princeton man. He has written for many national magazines like Vanity Fair, Smithsonian, and Time. His other books include 1941: Fighting in the Shadow of War: A Divided America in a World War and The Bonfire: The Siege and Burning of Atlanta. The Millionaires’ Unit inspired a documentary film of the same name. By Marc Wortman, PublicAffairs, New York, NY. (2006). Reviewed by LTC Carolyn Erickson, USA, Military Faculty Joint and Combined Warfare School-Hybrid, Joint Forces Staff College. Buy The Millionaires’ Unit now!